A 48 year-old woman was found next to a car after a low-speed crash. Initial examination findings at the scene were GCS 9, localising to pain, with an open occipital wound. She was BIBA and intubated in ED (best motor score prior to intubation was M5). Q1. 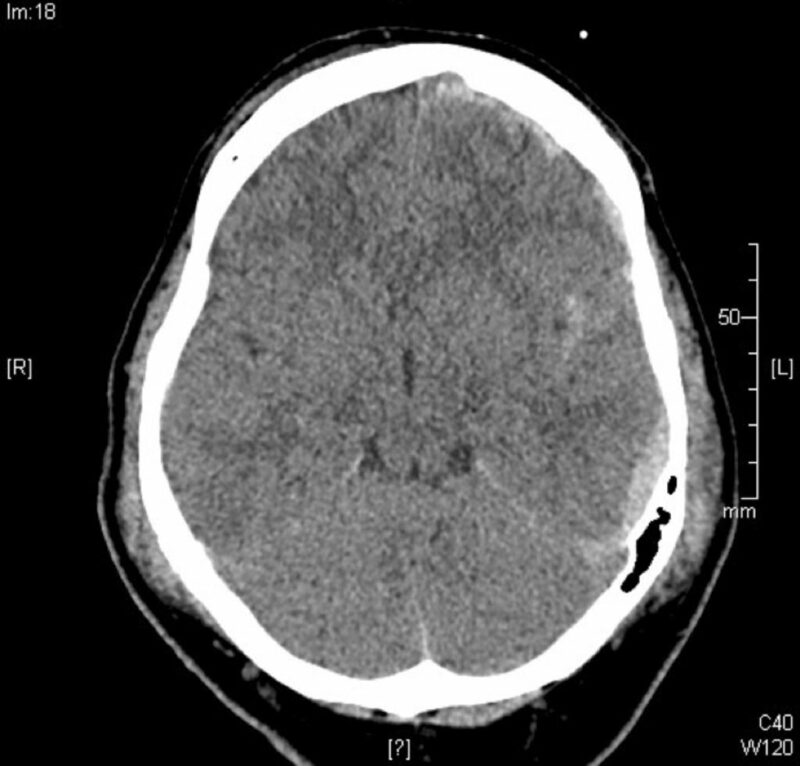 Describe findings shown in the CT brain image above. Subarachnoid blood in the left Sylvian fissure, and over the tentorium bilaterally (may be extension of SDH). There is midline shift to the right hand side (up to 10mm). Ventricles appear small, suggesting a “tight” brain with raised intracranial pressure. There are scalp swellings consistent with haematomas bilaterally. There is air in the bone in the left parietal region, which may be the result of a nearby fracture given the clinical history. Q2. An arterial blood gas is obtained, as shown below. Interpret the findings and their significance for the management of her traumatic brain injury (TBI). This gas shows an increased A-a gradient, as the PaO2 is only 61 at FiO2 0.45 (an estimate of the expected PaO2 = 500 x FiO2 = 225 in this case). This may be due to aspiration due to low GCS, pulmonary oedema as consequence of TBI or its management, collapse or pneumonia. There is an alkalaemia, which is a mixed respiratory and metabolic alkalosis as evidenced by a relatively low pCO2 and raised base excess and HCO3 respectively. In this case, her minute ventilation is most likely being controlled on the ventilator to target a low-normal pCO2 (35 – 40 mmHg) for ICP control, as per Brain Trauma Foundation guidelines. The metabolic alkalosis is most likely secondary to frusemide use. There is elevated Na and Cl, suggesting the patient has received a large NaCl load. In the setting of TBI management this is likely due to hypertonic saline use, and the serum Na could be increased further to 150 acutely if needed for ICP control. At The Alfred ICU, boluses of 10-20mL 23.4% saline is used for this purpose, via a central line. Renal function and evolving hyperchloraemic metabolic acidosis would need to be monitored with the rising Cl levels. Glucose is normal and needs to be controlled to prevent secondary cerebral injury. We typically target a blood glucose of 6 to 10 mmol/L. Lactate is normal. Q3. Describe and interpret the findings shown on the monitor below. The most striking features of this monitor are systemic arterial hypertension and mildly elevated intracranial pressure (ICP) with decreased cerebral compliance. CVP: 22 mmHg (raised, but need to check whether patient in correct position to transduce). ICP monitor, currently transducing continuously. ICP 16 mmHg is raised, however this patient’s target is ICP <20 mmHg. P2/P3 > P1 in waveform, giving it a “rounded” appearance. This is consistent with elevated ICP and a “tight brain”. 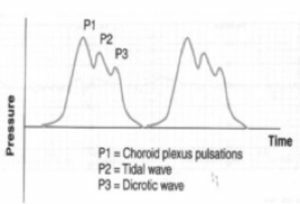 EEG trace: In this setting, it is being used to measure burst activity in a patient on a thiopentone infusion aiming to achieve burst suppression for ICP control. It may also be for exclusion of epileptic waveforms, in the post -TBI patient that doesn’t wake up. The patient is not currently burst suppressed. 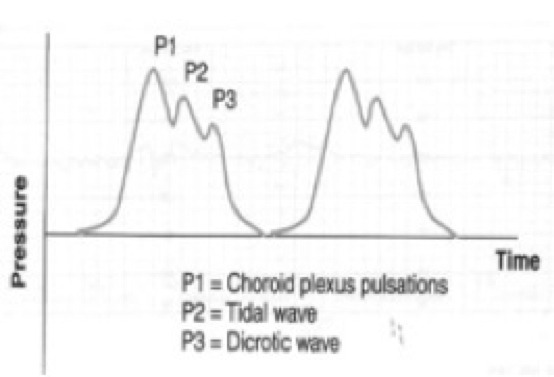 End tidal CO2: etCO2 31 mmHg with normal waveform. This needs to be correlated to ABGs to assess difference between etCO2 and pCO2, then can be used to monitor changing pCO2 between gases. Q4. What are the specific targets and ICU medical management for the patient with TBI? Maintain CPP of 60mmHg: this requires arterial line and ICP monitoring, with the axis at the level of the tragus for both. If the patient is on noradrenaline to maintain CPP despite the hypotensive effects of sedation, the infusion rate could be reduced (e.g. to avoid a CPP >80 mmHg). Neuromuscular blockade: Particularly if shivering is a problem. Generally, deep sedation is adequate to ablate patient movement. Temperature: aim normothermia 36-37; these patients often get central hyperthermia +/- fevers due to infection (e.g. ventilator acquired pneumonia or VAP). Fevers are associated with poorer neurological prognosis. Venting EVD: if EVD is in situ, this can be vented continuously with hourly transduction of ICPs, or on an intermittent basis in response to periods of raised ICP. Osmotherapy, usually hypertonic saline aiming for an increased plasma sodium of 145-150 mmHg. Mannitol is an alternative osmotherapy. Many severe TBI patients at the Alfred ICU are enrolled in the POLAR study and may be randomised to receive therapeutic hypothermia early, for a 72 hour period. 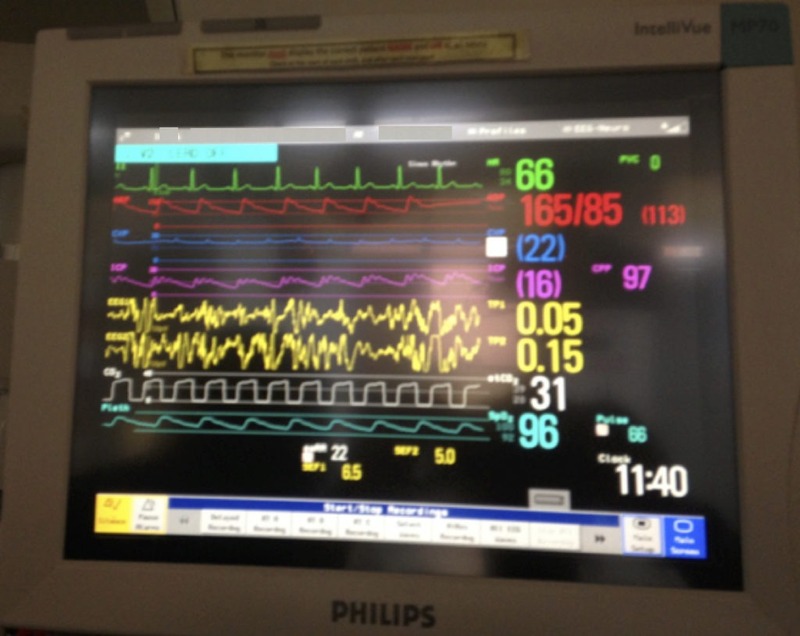 LAbs and Lytes — What does this monitor screen tell you about TBI?